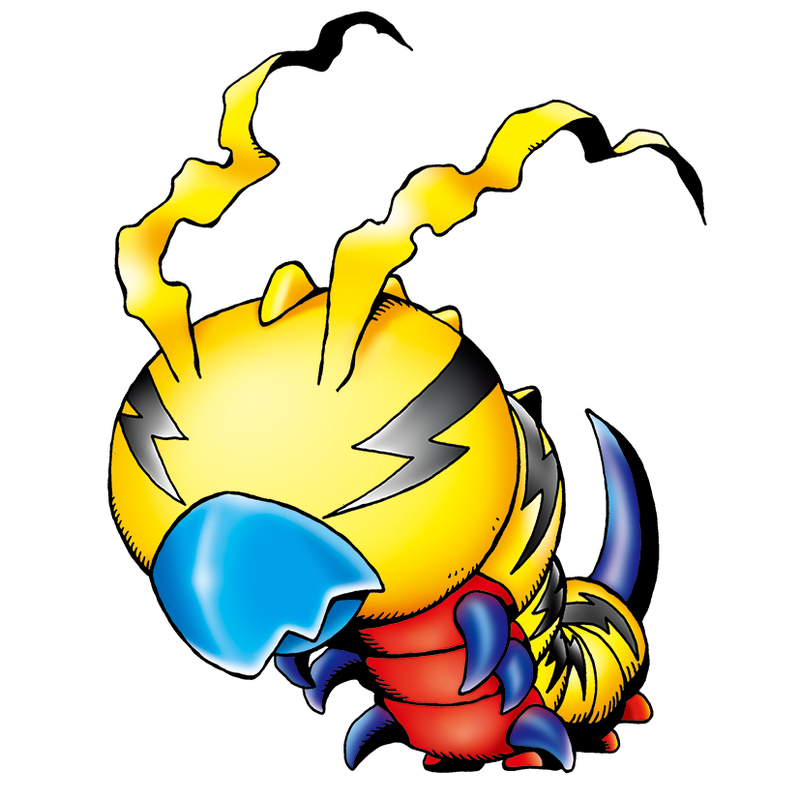 A Larva Digimon which has lightning-patterns all over its body. As young insectoid Digimon are very unique beings among other Digimon, its evolved form is still unclear, but it seems to be obvious from Kunemon's discovery that there exist Insect Digimon other than Kabuterimon. Although it is uncertain whether the lightning-patterns on the portion considered its face can are organs equivalent to eyes, because they change shape in in accordance with its emotions, it is said that they probably are eyes. Its personality is fairly malicious. Its Special Move is an electrically-charged thread of silk spewed from its hard beak (Electric Thread). If you get entangled in this thread you can get knocked out by the intense electric shock. — Digimon Adventure 02: "The Insect Master's Trap!!" Short for kunekune 「クネクネ」, an onomatopoeia for "wiggling". Anime/Manga Digimon Adventure 02: "The Insect Master's Trap!!" エレクトリックスレッド Erekutorikku Sureddo Electro Thread/Electric Thread Entangles the enemy with an electrified silk thread spewed from its mouth, or simply spits electricity. Stings the foe with its poisonous tail. 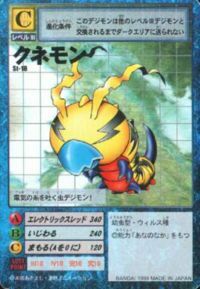 パルジィスレッド Paruzi Sureddo Speeding Thread Spits an electrified thread from its mouth to paralyze the enemy. Ijiwaru  Malicious いじわる N/A Poison Winder Leaps on the opponent to stab them with its poisonous tail. In ZT28, several Kunemon are among the Insect Digimon controlled by Archnemon. A Kunemon Realized at Chika's school, killing the school's pet rabbits and controlling one of the students who took care of them. It evolved into Flymon and faced off against Sunflowmon, but was defeated by Geo Greymon. 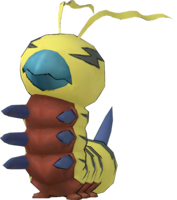 Kunemon appears as an obtainable Child-level Virus type Digimon in Digimon World. Kunemon appears as a NPC Digimon that can be seen eating on top of a leaf bed in Unwavering Forest, specifically in Kunemon's Bed. When talking to it, Kunemon will say that it's hungry and requests the Player to give some food, which can be either any type such as a piece of Meat or a Digi-Mushroom. When it is given some food, Kunemon will eat it and fight the player, joining the city after its defeated. Once it has joined, Kunemon will eat a bush, opening an useful shortcut between the Village and the Digital Bridge. Bakemon (Kunemon can evolve into Bakemon naturally or via Death Evolution. When it fights against another Digimon and loses a heart. This has a random 10% chance of happening so its reccomended to save before trying it). Kunemon spits out a swirling electrified thread of silk that damages the enemy. 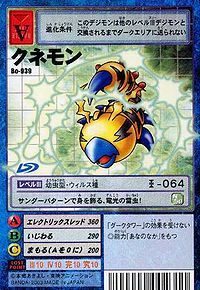 Inner data in the game found an unused evolution item that allows to evolve any Baby II-level Digimon into Kunemon known as Electric Ring (電気リング Denki Ring), although in the description Kunemon is referred as Kaminarimon (カミナリモン). 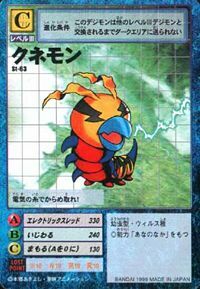 Kunemon is a Level III (Child) Nature Digimon card. It has 0 POW, +20 P, 680 HP, 350 Circle, 220 Triangle, 190 Cross with Jamming effect. Its Support Effect is allow to reduce both players' Attack by 200. Kunemon is also an opponent that appeared in Digi Bridge until it is replaced by Gabumon. Kunemon is an obtainable partner which can evolve to Kuwagamon regardless of its DP. 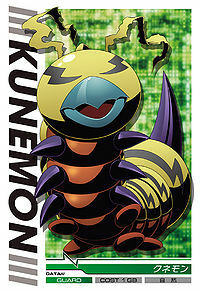 Kunemon is a Level III (Child) Nature Digimon card that has the same traits as Digimon World: Digital Card Battle. Kunemon, along with Bakumon, is one of the first wild Digimon that appeared in Central Park in Asuka Server. Kunemon is an obtainable Digimon card that belongs to White card with no S-Energy cost and has 1 AP / 1 HP. Kunemon can be evolved from Minomon if above Level 7, or can be found at Chip Forest. It can evolve to Yanmamon if above Level 18, Speed 75, and Bug / Grass EXP 250, or Flymon if above level 19 and Bug / Grass EXP 500, or Scumon if above Level 18 and total EXP 1500. Kunemon evolves from Mochimon. It can be evolved to Kabuterimon (20 Insect-AP), Thunderballmon (20 Machine-AP), Red Vegimon (10 Virus-AP) or Vegimon (passing time). Kunemon is available as a Digimon Medal. 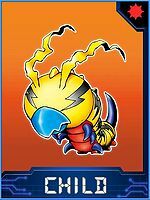 Kunemon is available as a Digimon Card. Kunemon evolves from Tokomon and can evolve to Bakemon, Drimogemon, Orgemon, Scumon or Shellmon. Kunemon is an enemy Digimon in Area 01. Kunemon evolves from Mochimon and can evolve to Centalmon, Scumon or Tyranomon. Kunemon is an enemy Digimon. 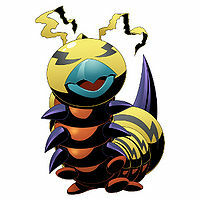 This insect Digimon spits out an electric thread! It attacks behind it with a thread of electricity! This electric worm's body is decorated with a thunder pattern! As a baby form of insectoid Digimon, it is a unique existence even among Digimon. Lightning patterns run throughout its body starting from its face, where its markings give the appearance of eyes. It has a fairly malicious personality. ↑ Digimon Savers: "Burn, Digisoul of Anger, The Flymon Hidden in Darkness"
This page was last modified on 19 April 2019, at 16:59.